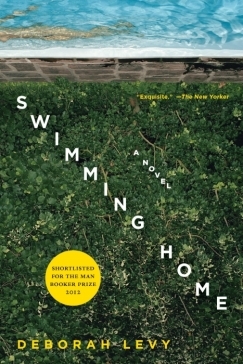 Deborah Levy's Swimming Home (Bloomsbury USA, 2012) made a lot of critics favorites lists for 2012 as well as being shortlisted for the Man Booker Prize but, although Levy is effective at setting a pervasively creepy atmosphere, I was not as completely taken as everyone else. A few paragraphs from the retrospective opening offer a good example of Levy's modern, brightly-illuminated diction. He leaned his head out of the window and felt the cold mountain air sting his lips. Early humans had once lived in this forest that was now a road. They knew the past lived in rocks and trees and they knew desire made them awkward, mad, mysterious, messed up. Her prose shines the garish light of a hangover over all she surveys - things are too brightly colorful, too clear, they make your eyes hurt, and her characters get now how perfectly obvious the whole mess was before. The thing is, I've not been drinking, and I felt like I got it from the start. Kitty Finch is found floating provocatively in the limpid pool of poet Joe Jacobs's Provencal rental villa. Joe and his daughter Nina wonder whether someone has drowned. Isabel, his wife, dives in to save her - something apparently in character as Isabel is a war correspondent whose daring in Northern Ireland and Lebanon have made her world famous, but also famously absent from her marriage. Kitty claims to have arrived mistakenly early for her rental of this same villa, and Isabel invites Kitty to stay in the spare room. Kitty's explanation turns out to be a lie. She has invaded the Jacobs family idyll in order to get Joe to read a poem she has written. This bold, naked, possibly suicidal nymph floats into the lives of the Jacobs much in the way the stranger invades the household in Pier Paolo Passolini's film Teorema. The strangers each represent some sort of spirit or force of amorality that liberates the wild energy hidden away in the lives of the bourgeoisie, although Passolini's feel more symbolic and Kitty is more rooted in the realities of modern life. She even has a diagnosis. Perhaps, as one character says, Isabel has invited Kitty so that she can leave Joe. Nina, their daughter, uses Kitty to exercise a little rebellious spirit of her own. In any case, although the atmosphere was skillfully set and the characters convincing, I really disliked them, with the exception of Joe who, having survived childhood in war-torn Poland, has an interesting backstory motivating (but not explaining) his behavior. We know from the outset that Kitty will wreak havoc on on the Jacobs lives and ultimately I felt frustrated by their obtuseness, bored by their passivity, and unsurprised by the outcome, despite Levy's craft. The garish light of a hangover but you've not been drinking. That's very good. Enjoyed this review but will be skipping the book. I don't drink much either. I'm looking forward to reading this. I usually enjoy books like this! I enjoyed the fact that you both read my same reactions, C.B. and Marie, and came to different conclusions about whether you were interested in reading the book. Vive la difference!